The night of trialling across the Nullarbor would see the demise of several competitors with many others losing large amounts of time. Many competitors would cut and run, deciding to stick to the bitumen highway rather than risking the rocks of the Nullarbor tracks. No one cleaned all these stages, but Bond faired the best overall, whereas Portman lost 1 hour 40 minutes into the Nullarbor Roadhouse after scrounging a spare tyre from Revs Rowney. Most punctured at least once, often two punctures simultaneously on one side on the same rock. By dawn the field was in disarray with big gaps and the Coolgardie servo doing a roaring trade in puncture repairs. The trial stage to the Nullarbor Roadhouse looked easy on the map, especially considering the 35 km of straight bitumen that runs from the “secret” Maralinga nuclear test site to the railway at Watson. But the stage was anything but easy. The first 69 km through sandy scrub country from Immarna to Maralinga was fairly slow going with lots of jumps and harsh dips. Carr at Maralinga. In the background are Commonwealth armed guards patrolling on the end of runway. At Maralinga crews emerged onto the vast Nullarbor Plain and for the early crews that saw this in daylight, it was easy to understand why the Nullarbor is so named – no trees! With no trees or other features, the gently meandering tracks looked deceptively easy but the razor sharp rocks probably caused at least a hundred punctures that night. The route followed the service track beside the railway for 53 km to Fisher and then turned south for 100 km to the relative civilisation of the Nullarbor Roadhouse. The early crews were also driving directly into the setting sun as they headed alonside the railway to Fisher. Once darkness fell, the Nullarbor is an eerie place with the lights of numerous other competitors visible far into the distance. What up to that point had looked pretty much like a sprint suddenly turned into a game of survival. The order at the front was Portman then Ferguson, Bond and Brock, the latter having lost road position on the tricky Marree transport the previous night. Bond punctured first on the sandy root strewn track up to Maralinga, but they had a service crew that had flown into the old runway there and managed to quickly replace the tyre, probably before Brock came through. On the run down the tarmac to the railway at Watson, the Commodore's superior top speed allowed Ferguson to overtake Portman's Stanza. It was just getting dark as they headed south from the transcontinental railway towards the Nullarbor Roadhouse. Shepheard in the HDT plane checked on the progress of the three Commodores with a no doubt superb view of the stage from above. Shepheard reported to Boddy over the radio that the 17 car was well ahead and there were no other cars in sight with most other cars striking some trouble back near the railway. (Soon after, Ferguson passed a local in a Holden ute and Boddy called Shepheard to report this, to which George replied "Ah, people trust Holden!"). Ferguson pressed on through the rock strewn Nullarbor to clean the stage, and was surely one of very few cars not to puncture. They never saw Portman again as they punctured multiple times, certainly letting Bond through into second place and, according to Brock, blocking the Commodore for 50 km driving on flat tyres. Brock may have punctured also but Bond almost certainly did not, and set the second quickest time. Amazingly, they didn't puncture at all across the Nullarbor except for the Maralinga flat. Others such as Carr, Johnson, Cowan and Fury may also have been held up or they may have simply had their own punctures. Mehta certainly had several punctures and lost a lot of time while Cowan had a fuel leak. Eventually Portman had to stop and he waited for someone to loan him another spare - Revs Rowney eventually did so. One story suggests that once he stopped that Thompson hitched a ride with Mehta to the end to get their service crew and come in against the rally traffic. In any case, Portman dropped 1 hour 40 minutes and dropped from 1st to 8th. Sutton punctured several times and ran out of spares near Fisher. Nalder punctured twice and like so many others just slowed down in order to make it to Nullarbor without further punctures. Stewart punctured several times and was either effecting a roadside puncture repair or just inflating his tyres higher because he borrowed Nalder's tyre pump. Dunkerton may have had punctures but certainly had continuing problems with a loose alternator. The Warmbold Audi had a holed fuel tank. The outright positions had been thoroughly rearranged with Ferguson surging into the lead with Bond second, as they were also on the road. The other factory Commodores and Cortinas were still in the mix, as were Johnson and Cowan, but behind them the field was strewn out over many hours. While the sandy road conditions to Maralinga probably deteriorated significantly for later cars, the remainder of the route did not. Yet some of the later times reflect incredible heartache as crews must have assisted each other to repair punctures, perhaps travelling to the end of the section to get spares and returning to stricken cars. The Ellis 120Y and Beveridge Volvo each lost almost three and half hours, whereas Quill, Miettunen, Lloyd, Taylor, Pittaway, Corr and Birrel would not make it out to the Nullarbor Roadhouse within their late time limit and would have to cut and run to Coolgardie or Perth, in some cases picking up a few controls along the way. Some did not emerge until the next day, having to wait for service crews to retrieve them with extra spares. It seems impossible that anyone could have retreated from Immarna but the results show Bray losing 4 hours 23 minutes and Glover with a loss of 5 hours 31 minutes, which both may have included a wrong direction at Nullarbor. In the end about 52 cars were credited with completing the stage within the late time limit. Hodgson and Sutton were both still running but each lost at least an hour on the stage. 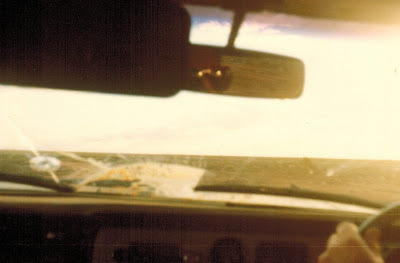 The Nullarbor Roadhouse is a lonely outpost on the Eyre Highway linking Western Australia to the east, but on that dark Wednesday evening in 1979, it was an incredibly welcome sight for the crews that emerged out of the rock strewn trial stage that ended almost adjacent to the roadhouse. Time was allowed for refuelling and service, mostly the replacement of punctured and destroyed tyres. But the night was still young and more torture was to come. But first was an easy drive along the highway to Eucla, just over the border into Western Australia. Here the rally changed from CST to WST, a 1.5 hour time difference which made the night seem even longer. A number of crews would need extra service, mostly getting punctures repaired, and would lose time on the transport, including Warmbold and McCubbin (2 minutes each), Watson and Mizel (4 minutes each), Jensen (12 minutes), Faulkner (16 minutes), Sheridan (23 minutes), Enter (43 minutes) and Stewart (50 minutes). Hurrey ran out of late time in the Celica and had to skip to Coolgardie. The Gawler Celica reportedly retired at Eucla with a "lack of funds". Another complication at Eucla was the number of cars rejoining that had cut and run from Broken Hill the previous day, or in some cases from Blinman. The front group of cars were unaffected and the road order was Ferguson, Bond, Brock, Carr, Johnson, Fury, Cowan and Mehta. Then came a group of interlopers including Colless, Richardson, Potter, Tattingham, Goldsborough, Meehan and Travis. There was some dust hazard and some later front runners may have been affected, although the roads were not deteriorting (the cars were deteriorating quicker than the roads!). In the next group were (roughly in order) Dunkerton, Portman, Rowney, Jackson, Nalder, Mason, Davis, Warmbold, Loader, Watson and Lund, possibly with other interlopers intermixed. This trial stage to Mundrabilla looped northwards onto the Nullarbor plain and back through some scrub and station country before descending the escarpment just before the end. The road was extremely fast and actually pretty good with relatively few rocky sections and not such a great risk of punctures. Seven cars cleaned. About 65 cars completed the stage and while the times stretched out, most were under half an hour. Enter would strike trouble, dropping over an hour and then having to skip to Coolgardie. Faulkner, Finlay, Maloney and Lahiff would short cut to the end and take a 4 hour maximum penalty and then they all skipped from Cocklebiddy to Coolgardie also. Glennie must have exceeded late time and also skipped to Coolgardie. Another easy drive along the Eyre Highway took crews to the lonely Cocklebiddy Roadhouse for fuel. If they were lucky they might have been able to meet their service crew, but the fast pace and spread out nature of the rally was now seeing many service crews fall behind their cars! In fact the stage was reasonably tight so crews needing extra service time would probably lose time, as did Mason, Watson, Herrmann and Roberts (3 minutes each) and Loader (5 minutes). The next section began over the road from the roadhouse and looked daunting. Not surprisingly, many crews decided that "discretion was the better part of valour" and chose to head straight for Coolgardie, necessarily missing the next two controls. With no easy escape route, once you committed it could be a case of running out of late time and maybe not even making it to Perth in time. Among those who cut to Coolgardie were some who had visited all controls up to this point, including Jensen, Faulkner, Clarke, Moloney, Sheridan, Murray, Finlay, Koseki, Lahiff and Penny. The Fritter 180B retired near Cocklebiddy with unspecified problems. The advice for this stage, "Sharp, tyre killing rocky outcrops for 190 kms", made it sound even more fearsome than the Nullarbor stage with a high risk of punctures. Little wonder that so many crews decided to cut and run to Coolgardie. The conditions were made all the more challenging by sections covered with water, which were incredibly difficult to see at night and hitting them as relatively high speed could throw you off the track into the rocky surrounds. Many crews punctured and given their previous experience at Nullarbor and the fact that there was no service until at least Kalgoorlie, most opted for a safety first approach, travelling at a snail’s pace. After Rawlinna the route followed the south side of the railway, again along a poor quality service track, but at 190 km it emerged onto a better quality gravel road that was followed all the way to the end at Coonana where crews crossed back to the control on the north side of the railway. When one considers the time losses of some crews that ran into an hour or more, it seems incredible that Carr cleaned and Bond dropped only 3. They either had bullet proof tyres or were extremely lucky. Nonetheless, the torture they were inflicting on their cars was soon to become evident. Others had countless punctures. Bell spun the 17 Commodore after a water splash and had two punctures. Dunkerton did the same, probably at the same spot. Fortunately there was nothing to hit except rocks. Cowan punctured two tyres in a similar place and Nalder also spun at the water splash and punctured, then had another puncture a bit further on. Mehta punctured two tyres at 68 km and another at 170 km, then had no spares until Kalgoorlie. Fatigue was also a huge issue, with some drivers having a sensation of constantly going up hill, others constantly downhill, but be assured, the Nullarbor is completely flat. Others were just in a daze and reported sensations of driving through a tunnel. The three man crews could change drivers but it was sheer hell for the two-man crews. The hours before dawn are always the most challenging when fatigue sets in. The Hodgson Falcon reportedly started the stage and punctured both rears at about 32 km so they returned to Cocklebiddy for more tryes. On their second attempt they broke a rear spring centre bolt and again returned to Cocklebiddy for repairs. On the third attempt they had another puncture and rear end dramas at 54 km and this time returned to Cocklebiddy to retire! Colless also started the stage but punctured multiple times and had to retreat from 94 km into the stage back to Cocklebiddy, then cut to Perth. There may have been others who entered the stage and then retreated. In the end 37 cars, including Sutton, completed the stage. As if to rub salt into the wound, from Coonana crews faced a further 65 km trial stage looping north through sandy scrub country and back to the railway at Karonie. It was in fact quite a nice stage, provided that you had some spare tyres left and felt that you could travel at competitive speeds. The first group of cars tackled this in the dark whereas the later cars were in daylight. It seemed that the fast times of the two leading Cortinas had extracted a price and they both had front suspension dramas that seriously slowed them on this stage, with Carr dropping a massive 34 minutes after a bolt fell out and they had to stop and wire it together. The number 9 Cortina would also need extra service in Kalgoorlie costing further time loss on the next transport. Johnson was also very slow in the Volvo, reportedly because of fatigue. As the leading two-man crew, Johnson had been driving for almsot 48 hours and was reportedly so fatigued that he had no idea where he was, simply driving in a tunnel. The run of the Sutton/Williams/Brock Datsun 1600 ended on this stage when they reportedly broke the engine after hitting a spoon drain too quickly (perhaps the one at 6.62 km that was clearly marked in the instructions, but tiredness may have seen the navigator fail to call it). 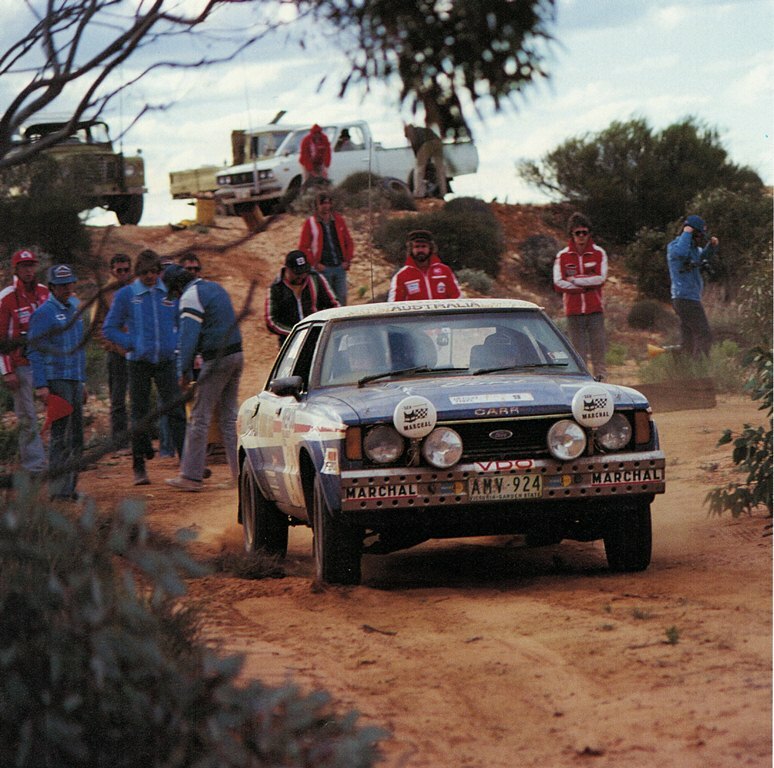 The results show the O'Donnell Torana as visiting the control but without going to the start of the stage so they must have gone around through Kalgoorlie, which was quite an enterprising way to pick up one extra control, albeit from the wrong direction. It was still dark on Thursday morning as the leading cars headed for the mining town of Kalgoorlie along about 100 km of mostly gravel roads. For all but the leaders it was definitely daylight. The slow running for some crews made them close on fuel as it was 515 km from Cocklebiddy to Kalgoorlie. The Warmbold Audi ran out of fuel about 30 km short of Kalgoorlie but borrowed fuel from Nalder and made it to Kalgoorlie OK. The Watson/Harrowfield Peugeot was low at Karonie and asked the officials if they had some fuel. The official had put several litres of petrol into the diesel tank before they realised the error but fortunately they also had a jerry of diesel so they put that in to dilute the petrol and hoped for the best! It didn't explode. After the Kalgoorlie refuel crews travelled the 35 km down the highway to Coolgardie where most met their weary service crews who had travelled along the Eyre Highway from Nullarbor and Cocklebiddy. The start of the next stage was just out of Coolgardie and with the lead cars about half an hour behind the revised schedule, the sun would have just been rising on another beautiful mild day as they started the next trial stage at around 6.30 am. Carr was 3 minutes late on the transport while Stewart was 33 minutes late, perhaps waiting for tyres to be repaired. Many others lost time while some booked in early to recoup precious late time since there was no extra late time all the way to Perth. Numerous cars that had cut and run from Nullarbor or Cocklebiddy rejoined at Coolgardie for the next trial stage and there was no attempt by organisers to prevent them from being interspersed with the cars that had completed all stages. In fact those who had done the whole route were spread over about a four hour period, and the whole field perhaps over as many as 10 hours so that the the last competitor may not have transited Coolgardie until late in the afternoon. By Coolgardie the number of cars that had visited all major controls had been reduced to 26 as listed below, with some previously in the top 20 (Sutton, Hodgson and Jensen) falling from the list. These results would barely change by Perth. Wes drove the Maralinga stage to the Nullarbor Roadhouse, which for us and many others was a real “horror” stage due to punctures. We must have gone into the stage 12th on the road (Brock, Portman, Ferguson, Bond, Johnson, Sutton, Carr, Dunkerton, Jensen, Stewart and Fury ahead of us, Cowan and Mehta next behind then others including Rowney, Hodgson, Jackson and Davis). Cowan and Mehta both passed us on the horrible yumpy rough sand track up to Maralinga. Once again, we weren’t prepared to punish the car that much. We saw the service guys in the aircraft at Maralinga but didn’t stop as we had a full complement of 3 spares. That all changed once we got onto the rocky Nullarbor tracks. On the run next to the railway line from Watson to Fisher we were heading directly into the setting sun and like so many others, we punctured two tyres at once. Three cars went by as we changed them, including Hodgson. We were now down to one spare so set of rather over-cautiously, not wanting a repeat performance. Before Fisher we found the Sutton Datsun 1600 out of spares and John Brock begging to borrow our remaining spare - sorry, but no way! It was slow and nerve-racking, especially from the back. As night fell we could see taillights ahead and headlights behind as far as the eye can see on this vast featureless plain. We were going very slowly and several cars passed us on the run south to Nullarbor, including Rowney, who we later found out had loaned Portman a spare. The Davis 180B also passed us but we re-passed them when they punctured. We also passed Stewart who was fitting a tube and we did loan him our pump, which was returned to us in Nullarbor. We must have also re-passed Hoddo as we arrived before them and only just behind Portman and Jackson. We felt shattered to have dropped almost an hour and a half, but as we looked around, it was apparent that we were not alone and quite a few folks were still out there on the plain with no spares. Our service guys were at Nullarbor, having motored from Kingoonya, and we made an error of judgement only putting two spares in figuring on getting an extra one at Cocklebiddy before the Rawlinna stage but the service crew never caught us! We had “Nulla-burgers” before heading off on the transport, which I drove, clipping the tail of a kangaroo at 140 km/h! We stopped for a quick wash at the “border” roadhouse and headed up to the start of the next trail stage where familiar faces Pat and Albert Morris were officiating. I drove that next “short” stage which was generally good fun but we were still pretty cautious about punctures, especially when we passed Jackson who had punctured about midway. There was a “funny” in the route chart at a “T.L through gate” where I think we went the wrong side of the fence. After a kilometre we came to another road and a gate on the right so we just turned right through the gate and left onto the track on the other side and it all seemed to fit OK after that! The drop down off the Nullarbor just before control is quite spectacular – like coming to the edge of the world! I continued to drive along the highway to Cocklebiddy where Hilton’s service crew were stationed and we grabbed a third spare tyre even though Hilton was running 13 inch rims and us 14 inch I was pretty much exhausted and Wes took over the driving for the Rawlinna Rocks stage which we started at about 1 am. I was soon asleep but Wes hit a patch of water about 30 km into the stage and slid off the road bending the steering and puncturing. Stewart was the only car to pass while we were stopped for about 5 minutes. We punctured again at about 70 km while I was sound asleep but Wes was exhausted so I had a drive. We were now getting really psyched out about getting another puncture and we were going so slowly that several cars passed us including Dave Colless in the Datson 1600. But at 94 km we found Colless stopped with no spares and we felt a bit better that our “survival” strategy was correct. We reached Rawlinna OK but miscued a junction where Herrmann went past us. There seemed to be parallel tracks running alongside the railway and Warmbold and perhaps another car passed us on the other track. At 180 km I started to fall asleep and passed back to Wes. There was only 10 km of grotty track left and the it was onto the super-fast run from Naretha to the control at Coonana. We came into control just on sunrise behind the Audi and Tattingham’s EH Holden which we guessed had skipped some sections. Jackson came in behind us with us both losing nearly two hours and we discussed the fact that we had just “been careful”. On the two rocky Nullarbor sections we had lost a third of our total event score! Wes drove the Cundeelee stage through the sandy tracks to Karonie, which was quite good fun. We passed the Sutton/Williams/Brock 1600 in there stopped and apparently retired. I then drove through to the Kalgoorlie refuel. We found Warmbold’s Audi stopped 20 km before Boulder and he was out of fuel so we “loaned” him the small container of fuel that we had purchased back at Immarna. Wes drove down to Coolgardie where we found Hilton’s service crew who had our two flat tyres repaired, which took a while, and we made it to the start control of the next stage with less than a minute to spare! With our usual method of cut and run and information from someone who clearly knew the area well, we left the Eyre Hwy just east of Nullabor and joined the course about 15km north of the control. Our arrival at the control caused some comment at how clean the car was! We said that that stage from Maralinga had been easy! After changing a blocked aux tank fuel filter we headed west through the night. Here is where I had an experience that is still vivid today. Mark was sleeping and as I drove at speed along the highway, I saw I was approaching one of the TV transmission towers that straddle the Highway. As I drove through thr legs I remember looking up at the barbed wire around the legs to stop climbers, the red and white painted bands painted on the upper girders, the rivets in the girders and the red flashing light on top. About 5 km further along was another one,but this one had two legs planted in concrete blocks set in the middle of the westbound lane and the other legs on the north of the road. Since I has to drive on the wrong side of the road to avoid the legs I thought this was a little odd and dangerous so I woke Mark and told him it was his turn to drive! I had heard of truckies stopping for ocean liners and now I understand how real they are!